With Ka = 50, you have a natural frequency of 15.95 rad/s and damping factor of 0.78. The complex conjugate root pair for the exact closed-loop model is close to the simplified model. 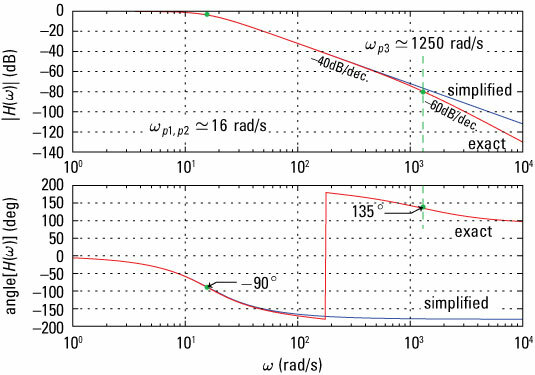 A third real root is included at –1,250 rad/s, again resulting in a time constant that decays very rapidly relative to the complex conjugate poles. The third pole at 1,250 rad/s (from the exact model) kicks in at about 80 dB of loop attenuation. This has little impact on the closed-loop performance as long as the loop gain isn’t too large.